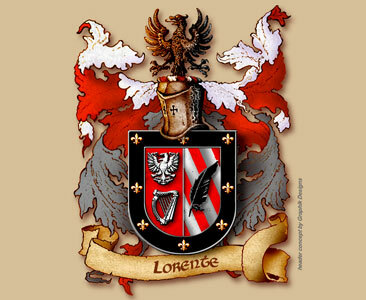 Lorente is a family name which traces its ancestral roots back to Italian and Spanish origins. It first appeared in ancient medieval records in Florence, Italy. The patronymic name of Lorente is derived from the given name Lorenzo, which is itself derived from the common latin word meaning laurel. Italy : Lorente is one of the old patronymic surnames common in the region of Tuscany (Toscana) and Florence (Firenze), Italia. Lorente or Lorenzo is of Latin origin, and its meaning is "from Laurentum." Laurentum was a city south of Rome known for its laurel trees. During the Christian era, many people named their children after saints and biblical figures. The popularity of this given name was due to Italian Saint Lorenzo an early Latin church martyr, who died in around 258 A.D.
Patronymic names are those derived from the father's given name, This system of name-making was widely used because it linked well with the existing feudal system. In Italy spelling variations include : Lorenzo, Lorenza, Lorenzi, Loren, Lorencio and many more... The name Lorenzo was brought to Britain with the Norman Conquest and became Lawrence. Spain : The family name Lorente emerged during the period of history known as the Middle Ages, as early as the mid-9th century, when the Visigothic nobles took refuge on Northwestern Spain from the Muslim invasion of the peninsula. Bearers of the name Lorente not only held lands and estates in medieval Spain but were also actively allied with other influential families. In the Iberic peninsula, names Lorente and Llorente are from the same linea despite the different spelling. Galicia and Castile : By the 8th century, when Asturias became a refuge for Christian nobles, some of Lorente established themselves on Northwestern Spain, in Cantabrian Mountains which was birthplace of the Christian Reconquest of Spain from the Muslims. In 718 the first King of Asturias organized a concerted resistance to the Muslim invaders and won the first battle of the Reconquista cruzade, at Covadonga. In the 10th century, Asturias included most of Galicia and some of the Basque country. Galicia was one of the most important Christian kingdoms of medieval Spain. In 1139, it was divided into two territories and the southern half, called Portugal, became an independent kingdom. In Portugal the name Lorente became Lourenco. During the later Middle Ages, Galicia declined in power as Castile became predominant. Castile (Castilla) was also very important during the Christian Reconquest of Spain, when the Spanish overturned Muslim rule, and it was where the Visigothic nobles resided. The patronimic name Lorente was first found in Castilla at Rincon De Soto (Rioja). Aragon and Basque Country : Bearers of the family name Lorente can also be found in kingdom of Aragon on Northeastern Spain. In 1137, Aragon and Catalonia united to form the Crown of Aragon, whose illustrious line of kings led the reconquest of the eastern peninsula from the Muslims. The Crown of Aragon emained an important power throughout the Middle Ages. In 1469, King Ferdinand of Aragon married Isabella of Castile and this union brought together the two most powerful kingdoms of Spain to create a united Spanish nation. The Basque country is located along the north coast of Spain, next to the western Pyrenees. The origins of the Basques remains shadowed in uncertainty although historians have attempted to link the Basques with Irish Celts or eastern European tribes. The Basques remained distinct even after the Arab invasion of 711 because they took refuge in the valleys of the western Pyrenees. After the 9th century, the Basques were politically aligned with a succession of kingdoms : Asturias, Navarra, and later Castile. European countries : Lorente also branched out into other territories and holdings in Europe before taking the long voyage to the new world. In Germany the patronymic name Lorente became Lorenz or Lorentz. In Scandinavia, the name took the variant Larsen and in France the name was formed as Laurent or Lorent, Lorend (Morbihan), Lorens (Lot-et-Garonne), Lorenti (Corsica) and many more. 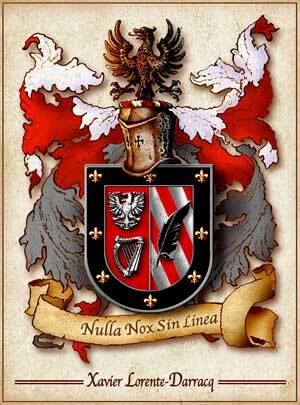 The name Lorenzo was brought to Britain with the Norman Conquest and became Lawrence. Some of the first settlers of the name Lorente or some of its variants went to the new world. Domingo Lorenzo arrived in America in 1528, Juan Lorenzo arrived in Cartagena in 1535 and Antón Lorenzo arrived in Río de la Plata in 1535. In 1722 Lorente de Araujo was Marquee of Astariz. In 1807, Antonio Lorente y González, was Knight of the Charles III order. In 1883, Angel Alfonso Lorente was the pontifical Count Of Lorente. Bibliography : Encyclopedy Heraldic et Genealogic Hispano-American by A. García Carraffa. Dictionnaire Heraldic and Nobles Spanish Kingdoms de Fernando González-Doria. Heraldario Espagnol, Européen et Américain de Ampelio Alonso Chaînes-López & de Vicente Chaînes. Patronímica espagnole héraldique et ses Patronímicos Composées. Dictionnaire d'Héraldique Aragonais de Bizén Rivière Martínez.